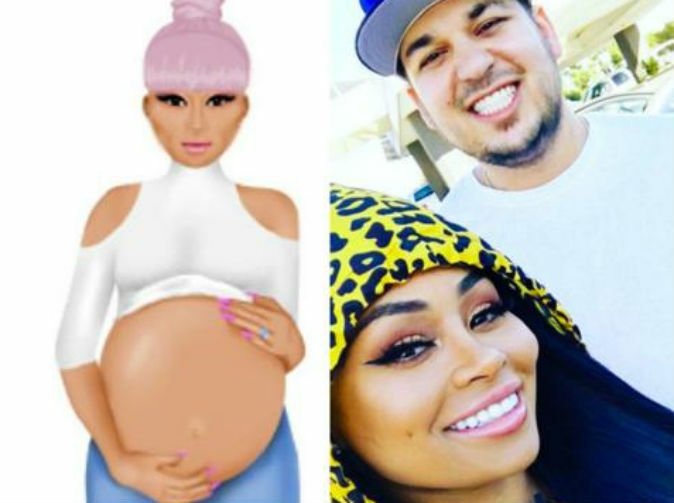 Rob Kardashian and Blac Chyna have confirmed that they are expecting their first baby together. The news comes just weeks after announcing their engagement. The couple took to their individual Instagram accounts to share the news with fans, posting an emoji of a pregnant Blac rubbing her belly. The pair caused raised eyebrows when they began dating as Rob's half-sister Kylie Jenner is dating Tyga, who is the father of Blac's only son, King Cairo Stevenson. Which now makes Rob and Kylie, who are half-siblings, step-parents to the same baby boy. The Kardashian clan have been quiet on the pair's engagement and there's still no word on social media yet from Kim, Khloe, or Kourtney about the baby news. However recently Kylie and Blac posted a selfie together, showing that maybe the pair, who've been at war since the Keeping Up With The Kardashians star began dating Blac's ex Tyga, had made up. TMZ claimed that Rob and Blac have recently been inundated with offers to televise their wedding, and are now considering starring in a reality series chronicling their upcoming nuptials. The American publication claimed that Rob and Blac could earn between $150,000 and $200,000 thousand each per episode, and $500,000 thousand for a wedding day special.